Let’s explore two specific questions: Number 1. Is there any scientific evidence that massage therapy is an effective low back pain treatment and improves a person’s quality of life? Number 2. Can a shiatsu massage chair compare to a human massage therapist? Before we get deeper into the evidence about low back pain treatment, let us state some facts and the conclusions we will make in this review. First, a lot of research on the effects of massage therapy as a treatment for a variety of health conditions has been carried out. And the evidence is pretty clear-cut. Second, the scientific evidence confirms that massage therapy is an effective low back pain treatment. The scientific evidence affirms that this type of therapy may help with back pain and may improve quality of life for people with depression, cancer, and other ailments. Researchers have studied the effects of massage therapy for many conditions. One of the areas they have studied more extensively is Pain. Here’s what the studies revealed. Therapeutic massage works. A 2008 research review and 2011 NCCIH-funded clinical trial concluded that massage may be useful as a chronic low back pain treatment. For women in labor, massage provided some pain relief and increased their satisfaction with other forms of pain relief, but the evidence isn’t strong, a 2012 review concluded. Numerous research reviews and clinical studies have suggested that, at least for the short term, massage therapy for cancer patients may reduce pain, promote relaxation, and boost mood. However, these studies also caution that deep or intense pressure should not be used over an area where the patient has a tumor or cancer unless such a treatment is approved by the patient’s health care provider. Lung function in children with asthma. Much of the results and evidence points toward the beneficial effects of massage therapy on pain and other symptoms associated with a number of different conditions. And much of this evidence suggests that these beneficial effects are short-term and that people need to keep getting massages for the benefits to continue. How massage therapy and progressive muscle relaxation compare as a chronic low back pain treatment in patients referred from primary care practices. The frequency and length of massages needed to address neck pain. A study of 401 persons, 20 to 65 years of age, with nonspecific chronic low back pain was published in the Annals of Internal Medicine on July 5, 2011. That study included a comparison of the effects of 2 types of massage therapy and usual care on chronic low back pain. That study confirmed the same results found above. Massage therapy is a chronic low back pain treatment. It also concluded that the beneficial effects of massage in patients with chronic low-back pain lasted at least one year after the end of the treatment. This latter fact is very significant. Now, at this point, we will examine the second question posed at the beginning of this review. That question is: Can a modern massage chair compare to a human massage therapist? Again, let’s look at the facts. These robotic chairs offer a wide variety of techniques to nearly replicate a human massage therapist. Today’s mid-range to high-end chairs provide many modes and options. These include Shiatsu, Kneading, Tapping, Flapping, Knocking, and functions like Back Heating; Back Stretching; Buttocks and Heating; Foot and Calf; Heating; and vibration. With a massage chair, you can localize your treatment to specific areas of the body. These areas include the Neck and Shoulder, Back and Waist, or Lower Body. Also, these chairs have a Foot Rest and Back Rest. They also allow you to adjust the intensity and speed in all of the above areas. With your chair remote control, you can choose a specific pre-designed program as a low back pain treatment, or you can customize one by combining many of the functions to fit your needs. You can customize your therapeutic massage based on the strength, speed, and muscle groups. If you change your mind or want to treat a specific area, you can change the settings with the push of a button. Massage chairs adjust to your weight, height, and body for an expertly tailored, customized therapeutic massage each and every time. Most of today’s high-tech massage chairs perform a scan of your body and then adjust the position and strength of the rollers to fit your exact height and weight. One advantage of these chairs is that you aren’t relying on the judgment of a human being. These are sophisticated algorithms designed to generate the best therapeutic massage possible each time you sit in the chair. Also, most good massage chairs offer features that a massage therapist can’t. A massage chair can instantly apply heat to your back, feet, legs, or neck. These chairs can recline to a pre-set Zero Gravity position that helps to stretch and realign your spine. The technology in today’s medium to high-end massage chairs goes far beyond anything a massage therapist can provide. 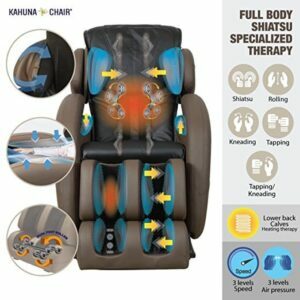 Massage chairs like the Kahuna LM6800 are equipped with Computerized body scan technology which scans your body size automatically, allowing you to enjoy a custom fit body massage. The KahunaLM6800 also includes a Yoga-Stretching program which is designed to stretch your entire body to awakening sensation. You will feel the blood circulation and stretching on your entire body after use. The signature SH-Chiro program in the Kahuna LM 6800 is designed to specially target your spinal area and unlock the nerve energy allowing it to flow better down your spine and throughout your entire body. You will feel the spine pressure relief after use. Therapeutic Massage chairs are more convenient and completely private. You don’t have to make an appointment, and you don’t have to travel. Your massage chair is at home when you need it. If you suffer from social anxiety, or just don’t feel like being around other people, your massage chair offers you customized, personalized massage therapy in the comfort of your own home. Your chair will provide you with predictable results every single time. Your massage chair will never have a bad day. If you don’t like the treatment you received from your chair, you can Choose a different program next time. Also, you can stop at any point in the massage therapy and adjust the settings to your liking. You are in control. A massage chair costs less in the long run. The Kahuna LM6800 currently cost less than $2000. Let’s assume you spend $75 to $100 for a decent massage. Well, after 20 to 26 sessions, you could have bought your Kahuna LM6800. And that chair will continue to give you premium massages for many years at no extra cost. If you add up the price of a massage, combined with transportation costs and the amount of time it takes. You will see that a massage chair is actually more cost-effective than a massage therapist. Number 1. Is there any scientific evidence that massage therapy is an effective low back pain treatment that improves a person’s quality of life? Number 2. Can a modern massage chair compare to a human massage therapist? We have answered both questions. The first answer is YES. A number of reputable research studies confirm that Massage therapy is an effective chronic low back pain treatment. The presence of a Kahuna Massage Chair in your living room or family room will turn your home into a therapeutic massage center. These studies also confirm that the beneficial effects of massage in patients with chronic low-back pain lasted at least one year after the end of the treatment. The second answer is also YES. 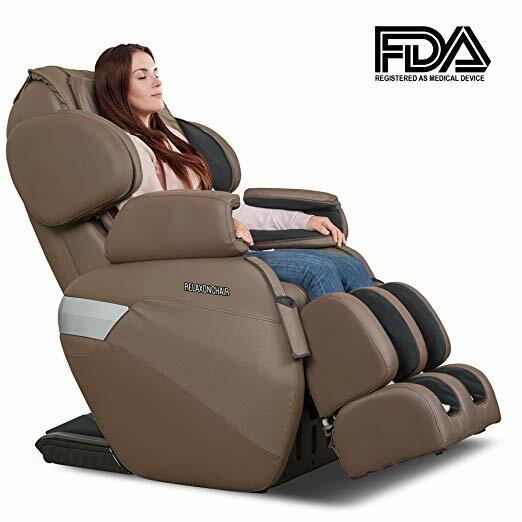 We have made over 20 comparisons between a massage therapist and a massage chair and have concluded that massage chairs offer you many features that a massage therapist can’t. 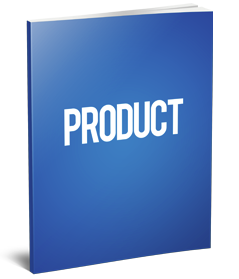 These features include many functions specifically designed to serve as a low back pain treatment. 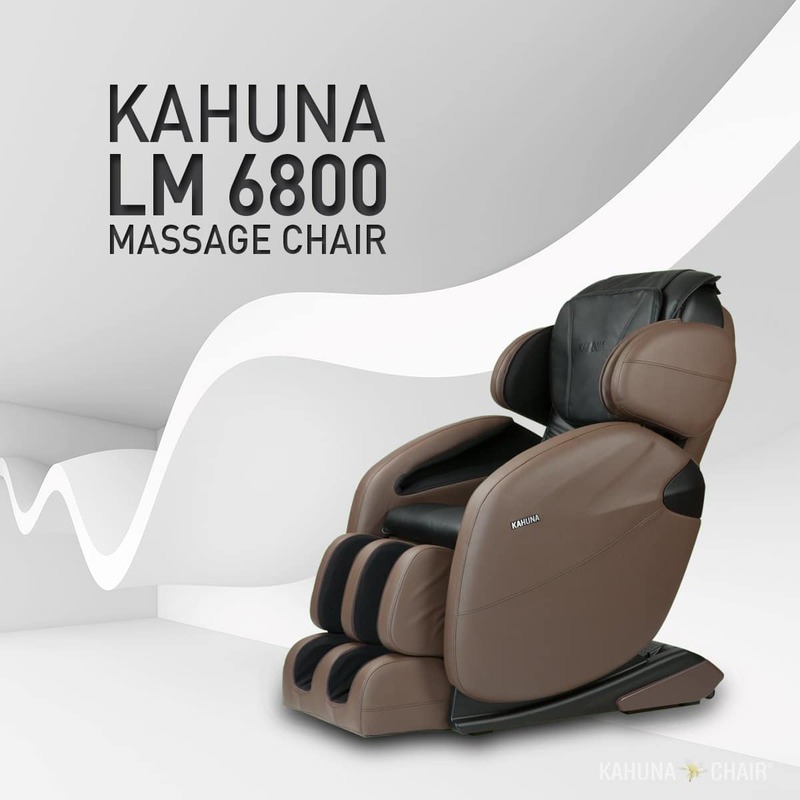 We have also demonstrated that a massage chair like the Kahuna LM6800 is actually more cost-effective than a massage therapist. 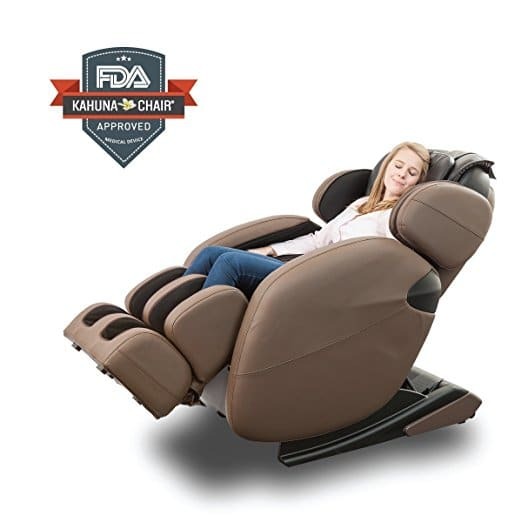 If you want to read more about a massage chair like the Kahuna LM6800 as a low back pain treatment, then go to this page. 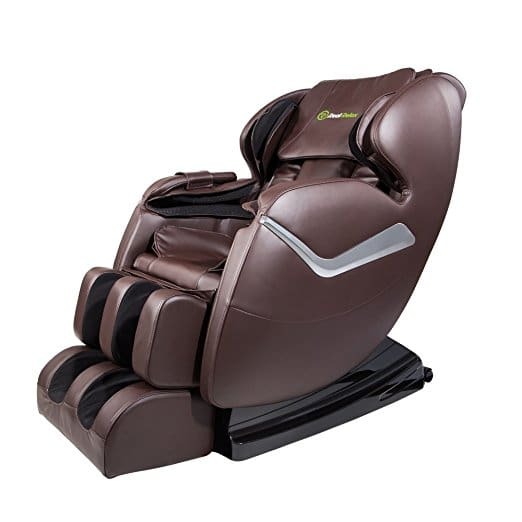 If you are convinced and ready to make that investment in your very own Kahuna LM6800 massage chair, then check out Amazon.